Having previously discussed how to frame the problem and identify the users, let’s move on to mapping out user tasks and workflows, and sketching out solutions. User-centered software design and development arose from the recognition that we must account for human capabilities and characteristics when we build systems and technologies. That’s why so much emphasis is placed on understanding users through research and on empathizing with them by employing tools such as personas and proto-personas. In order to understand the users, you identify their demographic, psychological, and behavioral characteristics, as well as their goals, needs, pain points, and possible solutions to their challenges. And to place that information in context, you build a narrative within which your users function as they use your product. At the very least, when building a product you will create a user flowchart to capture tasks the product should support, decisions the user will be making within the system, user inputs, and system outputs. While a user flowchart is a useful and succinct way to diagram tasks that need to be supported by an application, there are other methods of capturing user actions that are more story-based and thereby help build a richer representation of user behaviors. Agile user story mapping is a visualization technique introduced by Jeff Patton that depicts a user’s path through an application. It can also be used to map out user workflows outside of the application. In Agile software development, a user story is a brief description of a desired feature that is written from the perspective of an end-user, and that captures user outcomes that the feature is meant to support. Mapping user stories is a group activity in which teams build a narrative about how users engage with software. 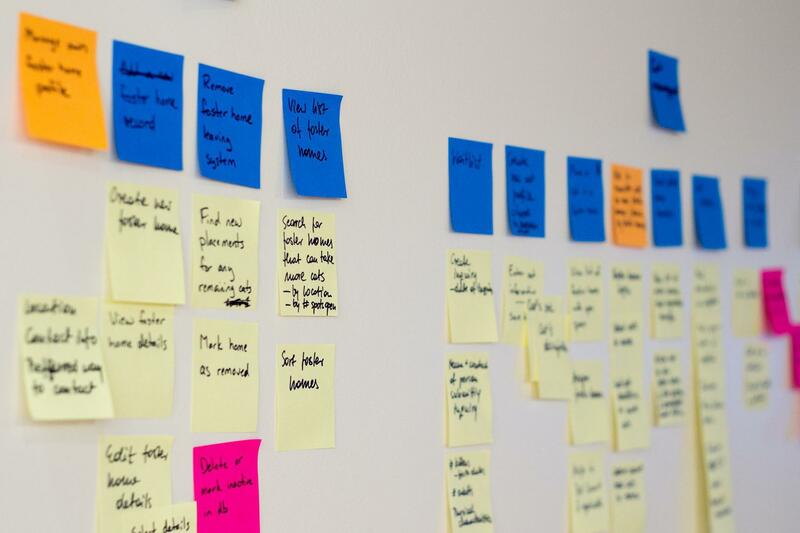 Using sticky notes, stakeholders and product teams map out user workflows, tasks, task variations, and sub-tasks in chronological order from left to right, and in order of priority or detail from top to bottom. 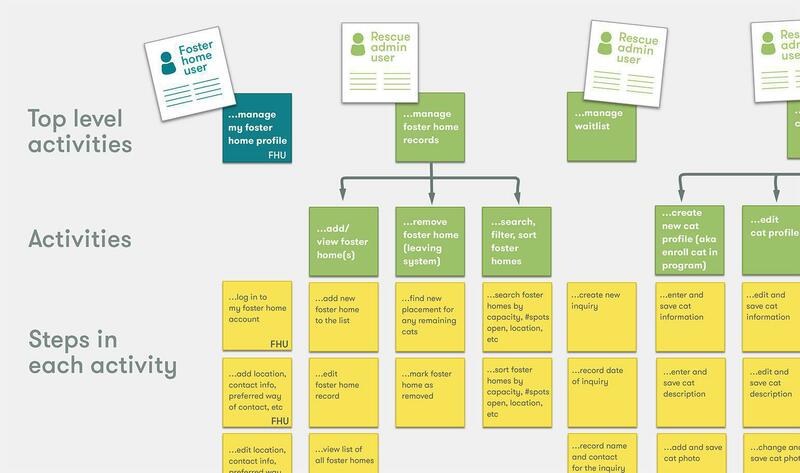 The resulting user story map is an artifact that offers a quick look at the application’s big picture while preserving a level of detail that can be leveraged to create a backlog. It also shows feature prioritization and can assist in the estimation process. User experience mapping (or user journey mapping) is the process of capturing and communicating complex user interactions across various channels through which the user comes in contact with your product and/or company. It helps build an understanding of user actions, feelings, thoughts, pain and satisfaction points that go beyond the realm of the application itself. The resulting experience (or journey) map provides an omnichannel representation of user experience with touch points at which the user interacts with your product and opportunities to create new or better experiences. I recently learned about yet another story mapping technique. While I have not had a chance to try it out in my workflow, I found it intriguing and thought it worth sharing. 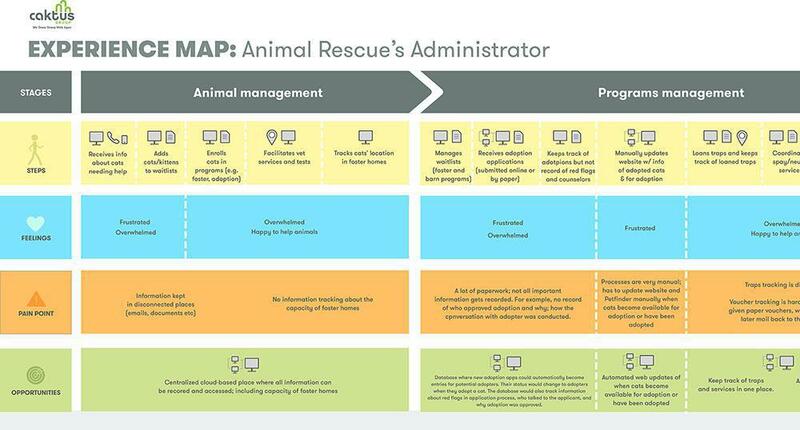 This approach to story mapping, popularized by Donna Lichaw, relies on a narrative arc as a framework to develop three types of stories — the concept story (the big picture story), the origin story (how your product will be discovered by users), and the usage story (how people use your product). The concept and origin stories are perfect tools for discovering new products, while the usage story can be leveraged to understand the current use and engagement patterns of your product and to identify opportunities for improvements. By this time in the process, you should know what problem you’re solving and for whom you’re solving it. You should also have a pretty good idea of what workflows and experiences your application should support. Now it’s time to start discussing specific solutions. Ideation: Work individually to produce as many ideas as possible (either by sketching or describing them in writing), then as a team select a small list of solutions that best address the problem at hand. Brainstorming: Work as a team to generate a wealth of ideas by finding inspiration in each other’s concepts, then work together at identifying the best ones. Prototyping: Build paper prototypes, sketch wireframes (on paper or digitally), or code a simple interface to start validating your ideas. You can test your prototypes with team members or recruit a few users and conduct lightweight usability testing. Each project is unique and product discovery should be tailored to the needs of each project. Whether you develop personas or proto-personas, draw user flowcharts, map user stories, or create an omnichannel user experience map depends on the product you’re building, the resources you have, and the project management paradigm your team follows. For Agile teams, the lean proto-persona strategy combined with small scale user research and agile story mapping can build a strong foundation of product discovery. But Agile teams will also benefit from the omnichannel perspective of a user journey map that places the product in the context of a broader ecosystem. At Caktus we often kick off a project with a discovery workshop. The workshop is an opportunity for our team and the client team to get together and build a shared understanding of the product to be built. Working off of existing data or making assumptions where data are lacking, we frame the problem, identify user types, and build personas or proto-personas. In the process, we also identify knowledge gaps and may recommend small scale user research as appropriate. On projects where the problem is well framed and users understood, we work with stakeholders to map out user actions, tasks, and workflows using a technique that best fits the needs and the budget of a given project. We come out of a workshop with a summary of product goals, identified target user types, and a list of the most valuable content or most valuable product features. If the workshop includes Agile user story mapping, the added benefit is an artifact that can easily be translated into a prioritized backlog. If, during the workshop, we map users’ entire and omnichannel experience, we gain a breadth of understanding of the user journey that goes beyond the application itself, and can support the development of current and future projects. By establishing in this way a solid, shared understanding of stakeholders’ and users’ needs before any code is committed, we increase our chances of making right decisions about what to build. And by doing so, we reduce the long-term cost because we reduce risks and decrease a need for rework down the road. Don't forget to read part 1 of this blog post to learn about how to get started with product discovery.